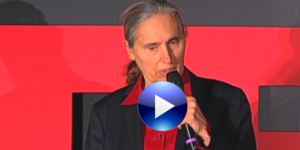 Dr Terry Wahls developed severe MS and despite cutting-edge medication she got worse and worse. A few years ago she could hardly move, couldn’t get out of her special chair. Then she started eating real food, hard-core Paleo. Probably the healthiest food you could find. She didn’t have time to discuss it in her talk but she also started taking vitamin D. She emulated a hunter-gatherer life. Now, a couple of years later, she is walking, bicycling and riding again. Pretty amazing. This is just an anecdote, it doesn’t really prove anything by itself. But there are many reasons to believe that our modern lifestyles and modern junk food is making millions of people sick. Dr Wahl’s story is a fantastic illustration of what could be possible. Removing heavy metals and removing the virus.